Excessive gas in the digestive tract can cause a number of uncomfortable symptoms, including pain or pressure in the chest and abdomen. While passing gas through belching or flatus may help relieve gas pressure, it can also be embarrassing. Depending on the cause of your gas, avoiding certain foods, eating slowly and taking certain over-the-counter supplements may help curb your excess gas production. However, if your chest discomfort is severe, you should seek medical attention, especially if you also have dizziness, nausea, sweating or shortness of breath. Belching accompanied by pain or pressure in the chest or upper abdomen may indicate gas in the digestive tract. Gas from swallowed air or undigested foods can get caught anywhere along the digestive tract, including the esophagus, which runs through the chest area. When gas pain occurs on the upper left side of the body, it is often mistaken for heart disease. Other symptoms of gas in the GI tract include abdominal pain, bloating and flatulence. While some belching and flatulence is normal, chronic burping may indicate a gastrointestinal disease, such as upper GI disorder, peptic ulcer disease, gastroesophageal reflux disease (GERD) or gastroparesis. For belching and chest pressure caused by excessive gas in the digestive tract, certain self-care measures may help relieve discomfort and limit your body's production of gas. Taking the time to eat slowly and not eating when you're anxious or on the run can help improve your digestion and thereby curb gas production from undigested foods. Avoiding cigarettes and chewing gum can also help control excessive gas, as these activities can cause you to swallow air, which turns into gas. Some other tips for reducing gas include drinking peppermint tea, taking over-the-counter supplements containing digestive enzymes, and the obvious, avoiding foods that frequently give you gas. For belching and chest pain caused by esophogeal acid, as with GERD, over-the-counter antacids or prescription antacids may help reduce symptoms. Talk to your doctor if you have gas or gas pains so severe that they interfere with your daily life, or if you have severe or prolonged pain in your abdomen, especially if your symptoms are accompanied by chest pain, nausea, vomiting, bleeding or weight loss. If your gas is accompanied by GERD symptoms -- including acid reflux or a burning sensation in the chest -- see a doctor, especially if you are turning to over-the-counter antacid relief more than twice a week. In many cases, medical treatment may help reduce or relieve the problem causing your gastrointestinal symptoms. In some cases, chest pressure may indicate a heart problem that requires immediate medical attention. MayoClinic.com recommends seeking emergency care if you have pressure, fullness or squeezing pain in your chest for longer than a few minutes, accompanied by dizziness, sweating, shortness of breath, nausea, fainting, or pain in the neck, jaw, arms: These are the symptoms of a heart attack. 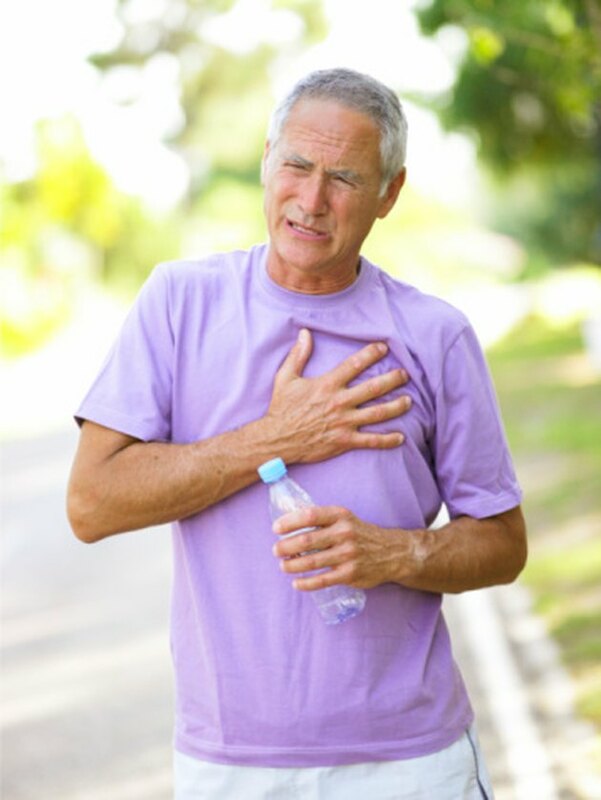 Angina is another potentially serious heart problem that causes chest pressure and is often mistaken for indigestion. With angina, a condition caused by reduced blood flow to the heart muscle, chest pressure may be accompanied by symptoms similar to those of a heart attack, such as sweating, nausea, shortness of breath and pain in the neck or jaw. Seek immediate medical attention if the pressure in your chest is accompanied by any of the abovementioned symptoms.